Welcome back to our five-part article series on how to leverage Facebook retargeting to increase conversions, leads and sales! 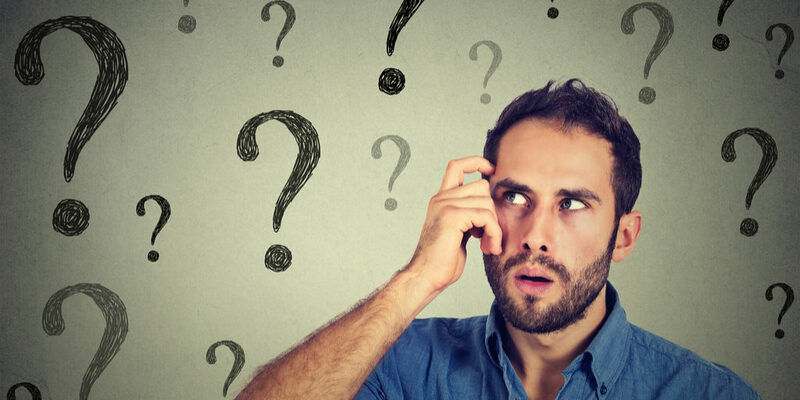 In this informative content series, we provide a step-by-step breakdown of how to use retargeting to reengage warm leads, win back lost conversions and recover the 98% of people who leave your website without converting. In Part 1, we discussed what retargeting is and how it can help businesses. If you don’t know what retargeting is, or you want a quick refresher, read that article here. 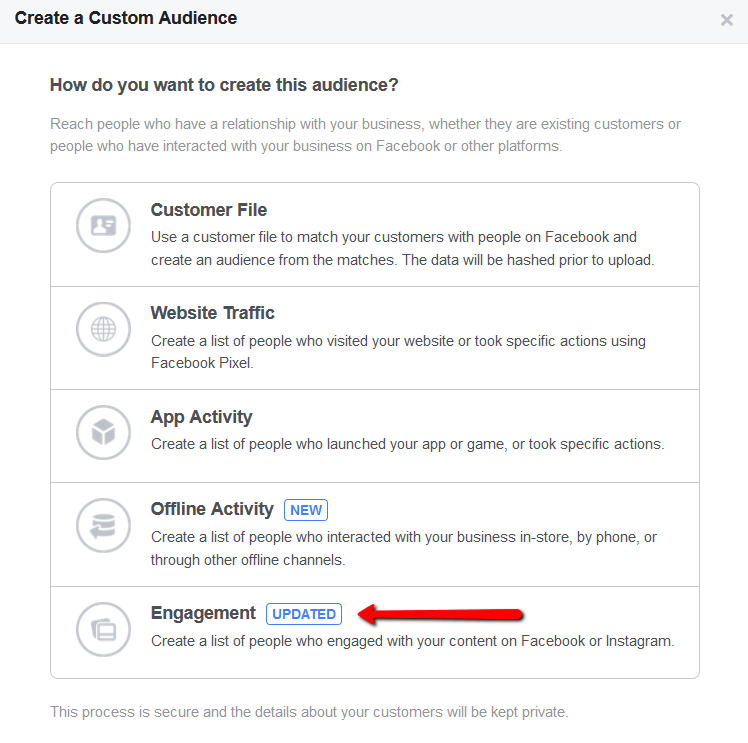 In Part 2 below, we are taking a deep dive into Facebook Custom Audiences, explaining what they are and how you can use them to launch your Facebook retargeting campaigns. Custom Audiences are the driving force behind your Facebook retargeting campaigns. They tell Facebook exactly whom you want to target with your advertising and give you lots of creative play to laser focus your campaigns. 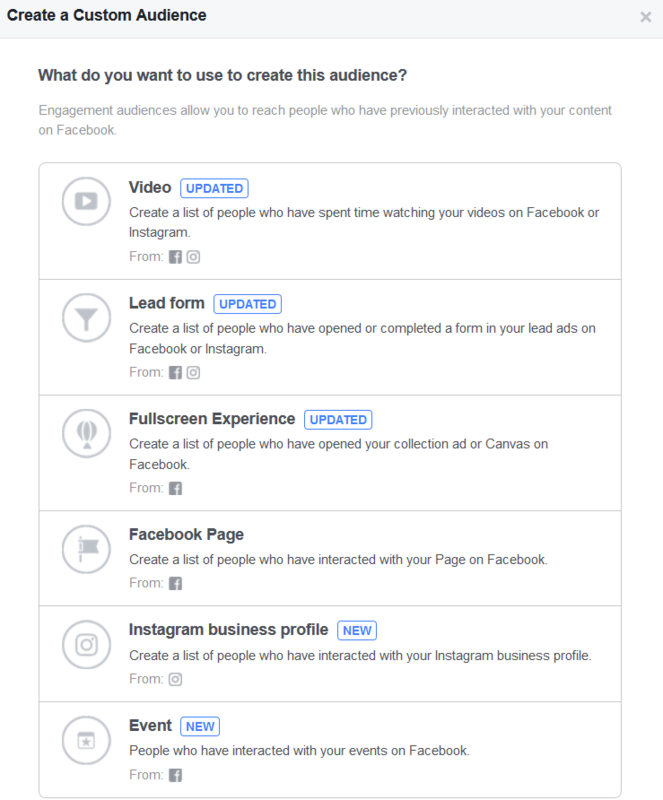 Facebook offers advertisers five types of Custom Audiences based on which people they want to target with their ads. They are as follows: customer file, website traffic, app activity, Facebook engagement and offline activity. 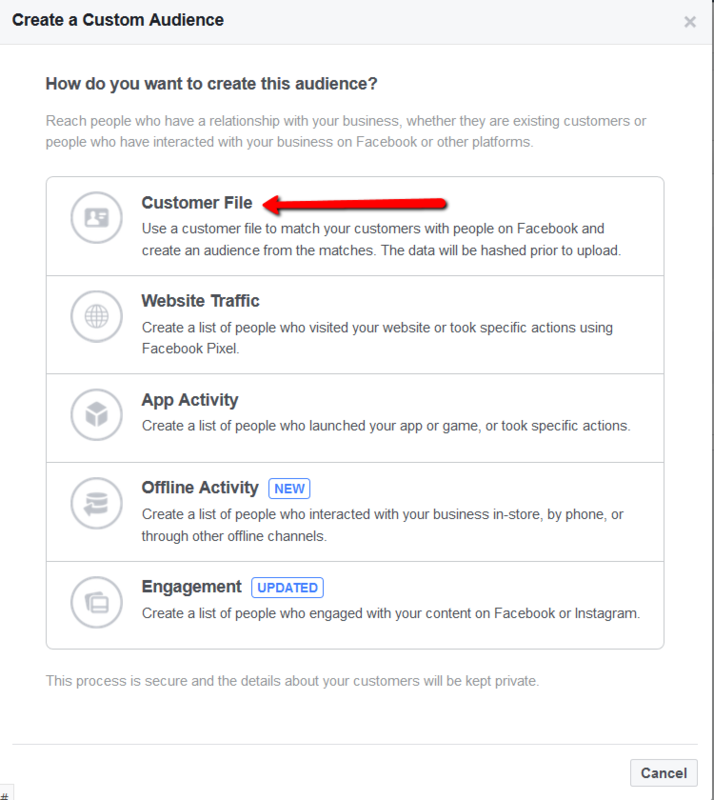 If you have a permission-based email list of subscribers, phone numbers or Facebook IDs, upload these lists as Custom Audiences and send ads to these targets. Facebook will match the people in your list to their Facebook profiles and target your ads directly to them (provided that you select this audience when launching your ads). Why retarget a list of emails or phone numbers? Retargeting an email list or specific people in your business rolodex (I’m aging myself) allows you to reengage with leads who have not yet become customers but may be interested in taking the next step. Since they are technically “warm” leads (because they have already interacted with you), they are more apt to move through your sales funnel, in contrast to those who never engaged with you (cold lead). Engaging with warm leads increases the chances of a conversion. Uploading a customer list on Facebook is fast and easy. Inside your ad panel, go to your Audiences page. Or, if you are logged in to Facebook, visit this link. Facebook will then direct you to upload your file of contacts (CSV/Excel file). NOTE: Keep one spreadsheet per type of contact (email, phone number, etc.). You can also import contacts directly from MailChimp if you use that email service provider. 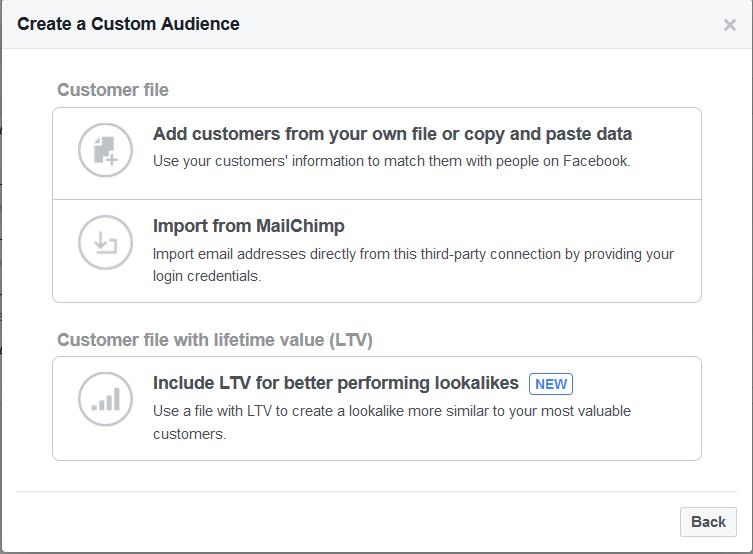 The last option is to upload a file that includes LTVs (lifetime values for your customers) so Facebook can create Lookalike Audiences similar to your best customers. We will discuss Lookalike Audiences in the next section, but you can find out more about value-based Lookalike Audiences here. If you want to target ads to website visitors who left your website without taking action, create a website traffic Custom Audience to entice them to revisit your site. IMPORTANT: Before you set up your website Custom Audience, install the Facebook pixel on your website. Facebook uses this pixel to track your website visitors’ activity. Add the pixel to all pages you want to use in your retargeting campaigns. We will talk about the Facebook pixel in more detail in Part 3. QUICK TIP: Use Facebook’s website Custom Audiences to retarget your website visitors based on the activity they performed on your website. For example, if visitors reviewed some of your products but then left without purchasing, display these products in an ad and offer a discount to entice them to go back and purchase. This is referred to as dynamic retargeting. Next, follow the instructions that correspond to the people you want to target. 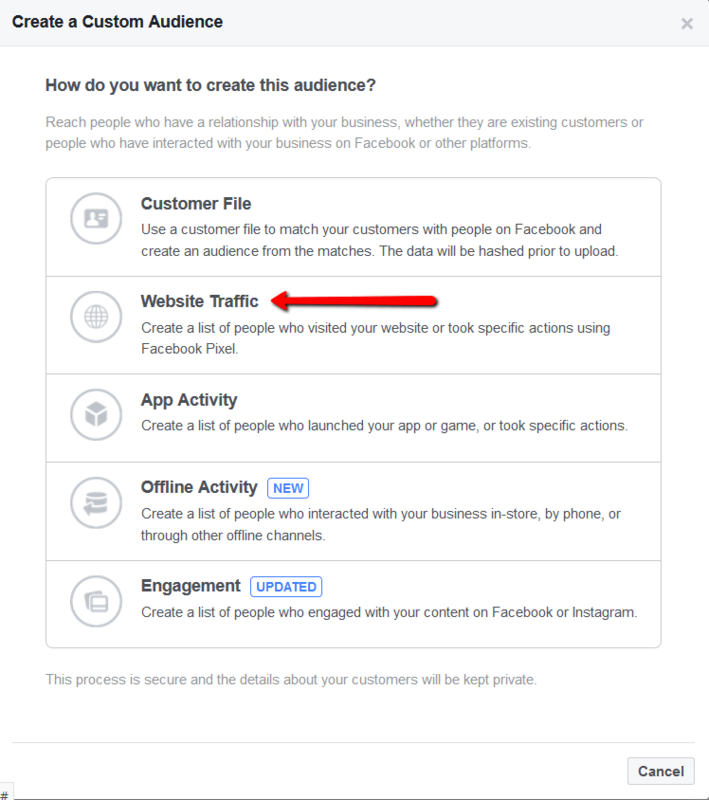 All website visitors – You would select this option if you wanted to target every website visitor with your ad and also specify a timeframe of how many days you want Facebook to collect visitor data. People who visited specific web pages – Select this option if you want to target people who visited specific URLs on your website. This will come in handy if you want to retarget your visitors based on a page they visited, such as a product page, opt-in page, product features page, etc. Visitors by time spent – Select this option if you want to target people according to the time they spent on your website. Facebook gathers the top 25%, 10% or 5% of your website’s active users during the past one to 180 days. As an example, if you got 10,000 visitors in the last 30 days, and you selected 25% and 30 days, Facebook would create an audience of the 2,500 (25% of 10,000) visitors who spent the most time on your website in the last 30 days. If you use this parameter, I recommend adding the Facebook pixel to all pages on your website. You can also designate specific URLs that these top visitors visited. From your events – You will notice at the bottom of the dropdown a section called “From your events.” In the image above, you will see “PageView” because this event was set up prior. You may not see the same event in your dropdown. Advertisers can track nine standard events performed by their website visitors. Here is a chart of the events. The events fire after you add the event code (far right column in the image) to your Facebook pixel code. We will discuss how to add this event code to your Facebook pixel in Part 3 of this five-part series. 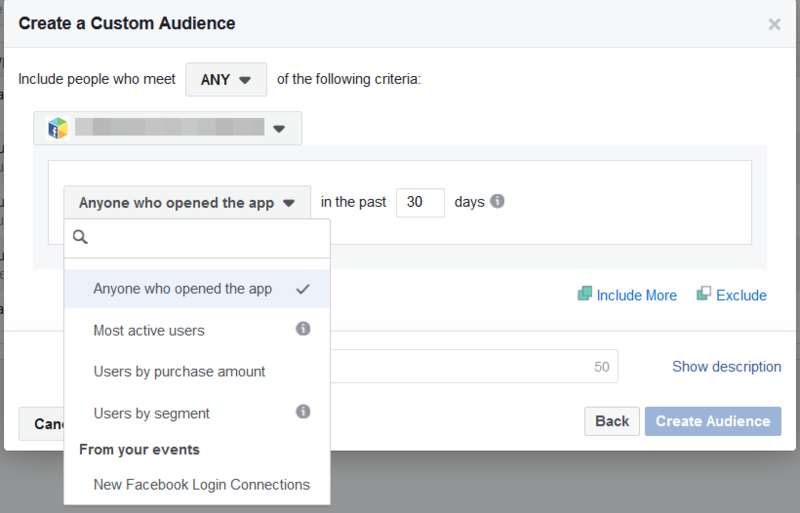 If you want to learn more about using events to retarget your prospects, Facebook published a tutorial here. Did you develop an app? If so, use Custom Audiences to create ads to retarget users! Some ideas: Target people who have not used your app in a specified period of time (such as the last 60 days). Or you can target users who added the app to their cart but never purchased it. Send ads to reengage them and entice them to pull the trigger on the purchase. Anyone who opened the app – All people who opened your app within a time frame you specify. Most active users – This option is similar to the “Visitors by time spent” feature in the website Custom Audiences. It allows you to select the top percentage of active app users and designate a timeframe. 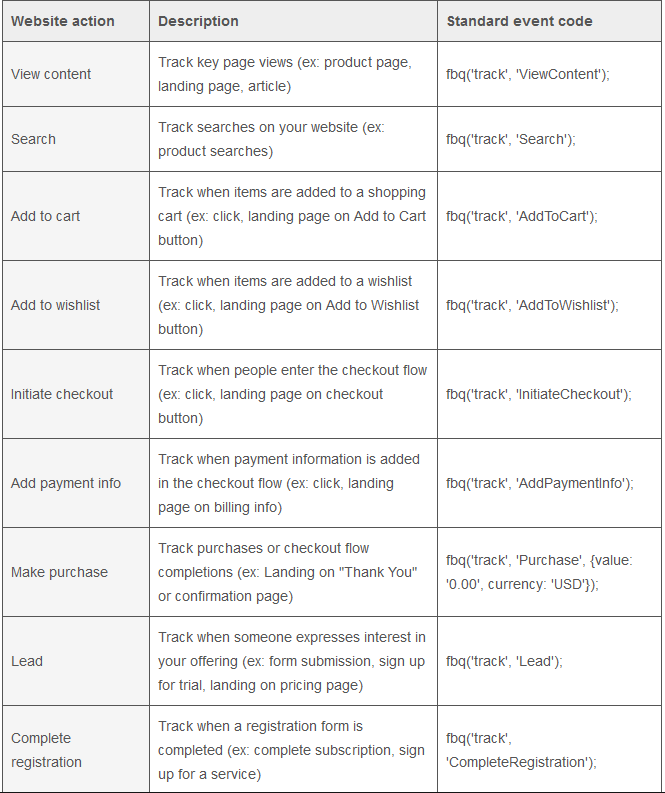 Users by purchase amount – Targets users based on their purchase amount. Users by segment – According to Facebook, a segment is a group of people you define in your Facebook Analytics according to several criteria, such as events, device information, app install source or demographic. 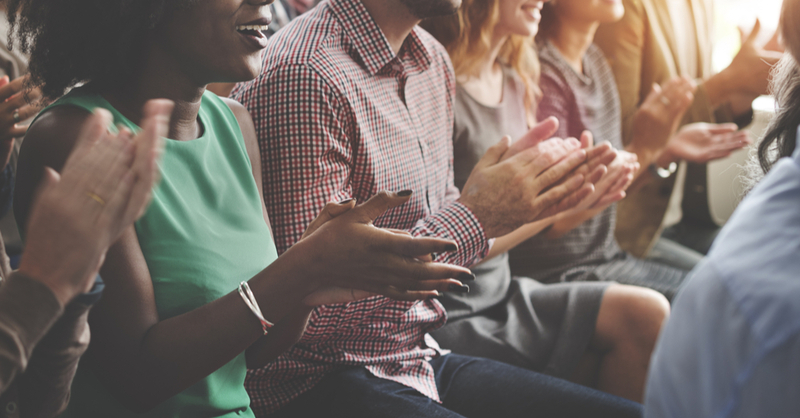 Here is more information on how to create a Custom Audience from segments. From your events – Similar to website audiences, you can target users based on event data. Note that you need to add App Events to your app to track actions people are taking within your app. 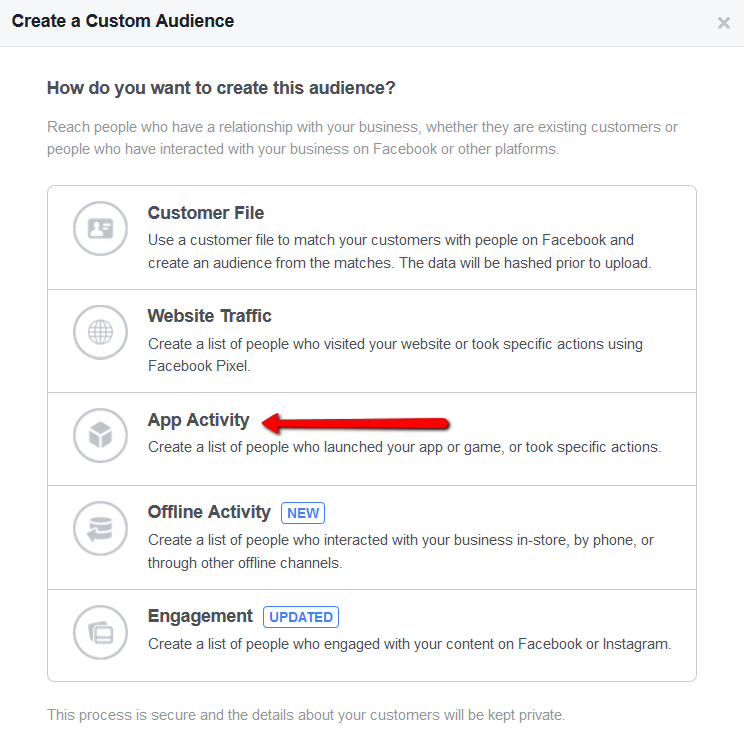 Visit Facebook’s app Custom Audiences page for more information. Retarget prospects based on their engagement with your Instagram and Facebook business pages. Interacted with your Instagram business profile. When you select your options, Facebook will present you with criteria based on user activity. Choose your ideal criteria to create your engagement Custom Audiences. Facebook recently offered a new type of Custom Audience for brick-and-mortar businesses with physical locations. Local businesses can connect the success of their Facebook ads to their customers’ offline conversions. Find out more about offline activity Custom Audiences here. Facebook gives you the option to INCLUDE/EXCLUDE data in the Custom Audience interface. Use these options to add more parameters for each audience or exclude data. For example, maybe you want to target the people who got to your cart page but never purchased. Add your cart page to the Custom Audience but exclude the order confirmation page to avoid targeting the people who actually purchased. 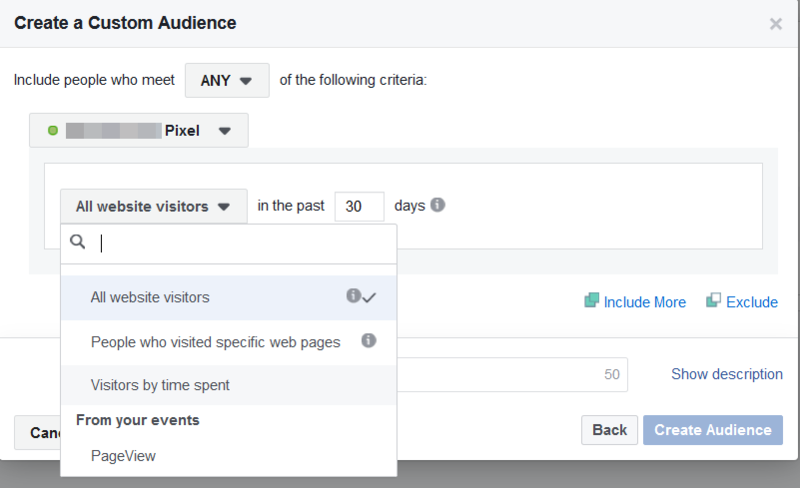 Play around with these settings to create multiple combinations to laser focus your retargeting ads. How do Lookalike Audiences come into play? We briefly discussed Lookalike Audiences in Part 1, but we will get into more detail here. Advertisers can tell Facebook to create Lookalike Audiences (people with similar characteristics and interests) from their Custom Audiences. Lookalike Audiences come in handy when you want to extend the reach of a high-performing ad, or if you need to cast a wider net due to low website traffic. First, you must tell Facebook the Source audience for your Lookalike Audience. This is where you will choose the Custom Audience or Facebook Page you want to create a Lookalike Audience from. Next, select a target Location or region for your Lookalike Audience. Lastly, choose your audience size from 1% to 10% of the total population of your chosen target countries. We recommend starting with 1%, as this will produce the greatest ROI for your ads. 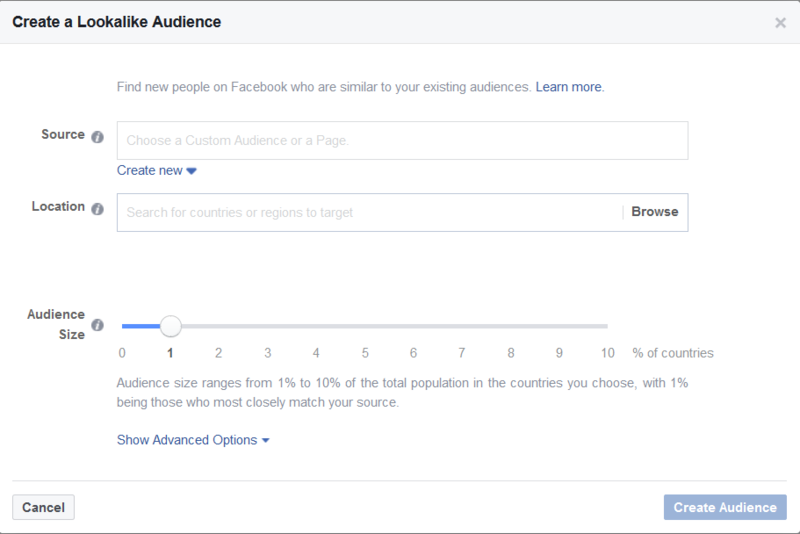 Facebook requires at least 100 people for your Custom Audience to create a Lookalike Audience from it. Facebook Custom and Lookalike Audiences provide business owners with multiple tools to retarget and attract more people to their brands to increase conversions and recover lost traffic. In Part 3 of this five-part retargeting article series, we will discuss the technical aspects of the Facebook pixel—what it is, how to install it and how to leverage it for your retargeting campaigns. Retargeting is a powerhouse marketing tactic for business owners who want to get the most out of their marketing and not leave any money on the table. It’s a game changer if you know how to do it right (Hint: That’s what we’re here for. We got you covered. ).